How Does 360 Balanced B Work? Vitamin B-12 may not be as readily absorbable as we age. In fact, the US Department of Health and Human Services Dietary Guidelines for Americans advise: “a substantial proportion of individuals ages 50 years and older may have reduced ability to absorb naturally occurring vitamin B-12. However, the crystalline form of the vitamin is well absorbed. Therefore, individuals ages 50 years and older are encouraged to include foods fortified with vitamin B-12, such as fortified cereals, or take dietary supplements.“ 360 Balanced B supplies this crystalline B-12 form. 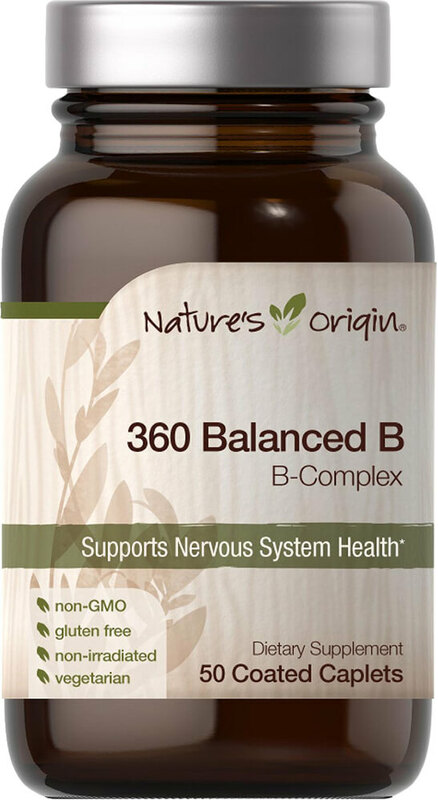 Why Take Nature’s Origin 360 Balanced B? Your body needs B-Vitamins, but is not capable of making them. Nature’s Origin 360 Balanced B is known as a B-100 complex supplement – it supplies across-the-board 100 mg or mcg B-Vitamin servings, with the exception of a 400 mcg folic acid serving. This presentation helps balance and simplify B-Complex nutrition. Nature’s Origin also taps pure, elemental B-vitamins found in food with a proprietary blend of alfalfa, watercress, parsley, soy lecithin and rice bran. No Artificial Flavor, No Preservatives, No Sugar, No Starch, No Milk, No Lactose, No Soy, No Gluten, No Wheat, No Yeast, No Fish. Sodium Free.